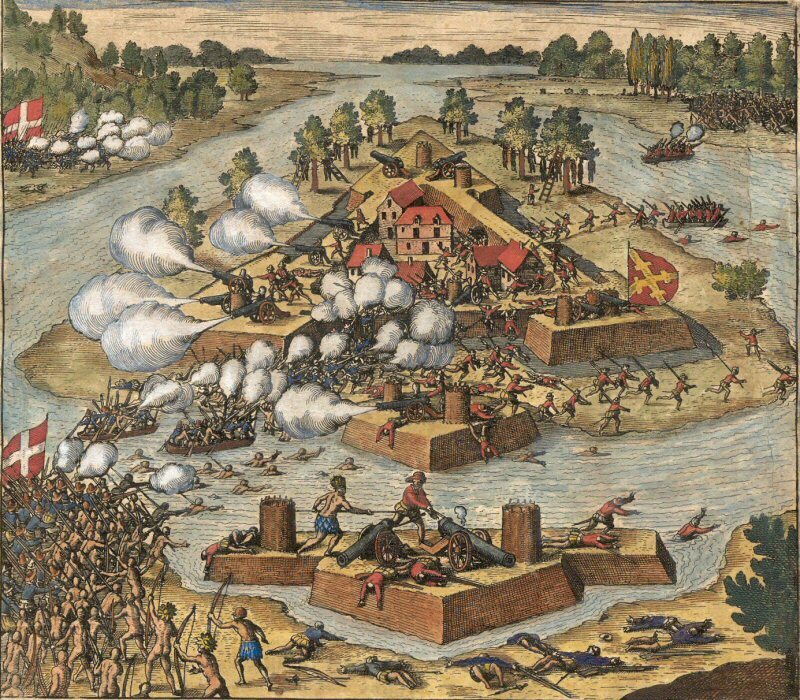 The re-taking of Fort Caroline by de Gourgues, showing the French and the Indians attacking from the shore and the Spanish starting to run away. Note Indian chief Olotacara using a pike to kill a Spaniard. This Saturday the University of North Florida will hold a debate between two sets of scholars to hopefully resolve the true location of Fort Caroline. This year marks the 450th anniversary of the founding of the French colony of Fort Caroline in America. Fort Caroline was the first permanent European colony in what would later become the USA predating the Pilgrims at Plymouth, Massachusetts by 100 years. The establishment of Fort Caroline is also important because it inspired Spain to establish it’s own first permanent settlement, St. Augustine, as a base from which to attack and destroy Fort Caroline. The success of this attack forced the French out and gave St. Augustine the distinction of being the oldest, continually inhabited European settlement in the U.S. Yet the location of the actual French fort has never been found by archaeologists. Historians, by following several lines of evidence, have made a “best-guess” placement of the fort on the St. Johns River in present-day Jacksonville, Florida. A small recreation of the fort has been built along with a museum at the Fort Caroline National Memorial. Yet, despite years of digging, archaeologists have found no physical evidence at this location or any other of the French fort or the later Spanish fort that replaced it. In February, scholars from the University of Florida and Florida State University made a surprise announcement that the true location of Fort Caroline was in Georgia not Florida. According to Dr. Anita Hill and Dr. Fletcher Crowe multiple lines of evidence convinced them that archaeologists have been digging in the wrong location. Based on their research they concluded that the only river that matched the French accounts of the location of the fort was the Altamaha River near Darien, Georgia not the St. Johns River in Jacksonville, Florida. 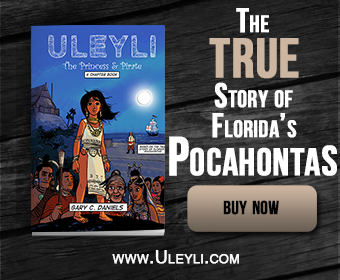 Researchers in Florida were skeptical of the evidence and remained convinced the fort was located on the St. Johns River in Florida. Now these researchers have invited the opposing side to a debate at the University of North Florida in order to present their latest findings. The debate will be held on Saturday, September 20, 2014 at 12:00pm and concluding at 1:00pm. More details can be found here.